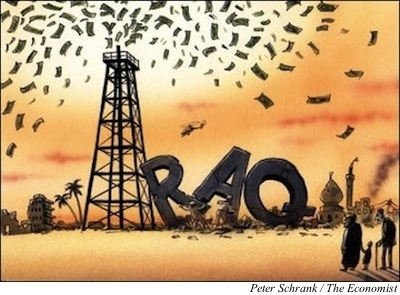 The Iraqi oil patch has been a coveted prize for most of the past century. The same concerns over oil supplies expressed in the wake of the Islamic State of Iraq and Syria's capture of key Iraqi cities were around during World War I. But Iraq's oil is even more needed now than it was 100 years ago, and while the turmoil there is having only a modest impact on today's oil market, it could sow the seeds for painful oil shocks in the future. On the eve of the 2003 Iraq war, oil experts held that Iraqi production could quickly be restored to the pre-1990 level of about three million barrels a day and ramped up to as much as six million barrels a day by 2010 and seven to eight million by 2020. Things didn't turn out that way. Political instability, corruption and the lack of an adequate regulatory framework turned away multinational oil companies. Foreign investment in the oil and gas sector came at a trickle. Iraq's production was so uncertain that even OPEC exempted the country from its quota system. Yet since 2012 it has seemed that Iraq might finally be turning a corner. Investment started to pick up, especially from China—Iraqi reserves constitute 26% of the oil assets of China's national oil companies. While Iraq today produces a little more than the three million barrels a day it produced before 2003, it was viewed by some as the next oil frontier. Last month the International Energy Agency noted that "in the long term Iraq is set to become one of the main pillars of global oil output, and will also become the largest contributor to global oil export growth." Iraq was expected to produce nine million barrels a day by 2035, surpassing Saudi Arabia as the region's largest exporter. Now the ISIS takeover of large swaths of oil-rich Iraqi territory threatens this hope. The potential implications for the world economy are serious. Other than the North American shale-oil boom, which has brought an extra three million barrels a day online over the past several years, there has been very little good news in the oil market. Saudi Arabia's production is stagnant at around 10 million barrels a day and its political future is in doubt. The country's gluttonous oil consumption—with only 28 million people, Saudi Arabia is the world's fifth-largest oil consumer—leaves less and less available for export. Meanwhile, Nigeria is facing problematic elections next year that could blow the top off an already shaky political system, Venezuela's oil industry is on life support, post-Gadhafi Libya is faltering, and the outputs of Russia and Iran are clouded by sanctions. What is at stake is not only the loss of Iraq's current output but its ability to secure the investments necessary to deliver the additional six million barrels a day the market is counting on. Today over 80% of the global investment in upstream oil and gas goes to replace depleting fields, and the Middle East accounts for only 15% of the world's overall upstream investment. With Iraq sinking deeper into protracted civil war, investment will fall even more, creating fuel shortages down the road. The loss of Iraq requires a three-pronged strategy to deal with the crude gap and insulate the global economy from ruinous oil shocks. First, the U.S. must commit to sustaining the North American oil boom for as long as possible. This not only means drilling and fracking domestically with the same vigor, but also working with Mexico to assist its energy reforms and open its offshore deep-water areas to exploration. Odd as it may sound, the future of the world's economy may be in the hands of shale-oil-rich North Dakota and Mexico City. Second, the U.S. should do its utmost to prevent disruptions and increase output in other major producers like Nigeria, Libya, Angola and Kazakhstan. It can do this by helping Kazakhstan expedite the development of its giant Kashagan oil field, working with Europe to restore stability in Libya, engaging with Nigeria to prevent post-election instability, and supporting Angola's bid for a U.N. Security Council seat in 2015-16. Third, the U.S. should join with China, the world's largest automobile manufacturer, in an effort to significantly increase the number of vehicles that can run on fuels made from natural gas and coal, resources both countries have in abundance. With minor adaptations to vehicles, natural gas and coal can be put to use in the form of alcohol fuels such as methanol and ethanol. These can be easily blended with gasoline and hence reduce transportation's dependence on oil. For the foreseeable future, oil will continue to be the lifeblood of the global economy. Our hope is that the turmoil in Iraq subsides and its oil fields reach their full potential. Meanwhile, the least we can do to protect the world economy from future oil shocks is to keep the price of oil at bay by allowing drivers to switch on the fly from gasoline to non-petroleum fuels. Mr. Luft is the co-director of the Institute for the Analysis of Global Security, senior adviser to the U.S. Energy Security Council, and a fellow at the Middle East Forum. Mr. McFarlane served as President Reagan's national security adviser and is co-founder of USESC.